The long-running decline in the proportion of Americans still tied to the labor force relative to the nation’s total population has been vexing economists and government officials for some time. They worry the sharp decline in what is called the labor-force-participation rate is a sign overall economic conditions have become so unfavorable many people are simply dropping out of looking for formal work altogether. Against that uncertainty, new research from the Federal Reserve Bank of Chicago argues half of the decline in the labor-force-participation rate over roughly the last decade is a demographic story rather than an economic one. In a paper published Wednesday, staff economists Daniel Aaronson, Jonathan Davis and Luojia Hu state the retirement of the baby boomer generation is a major driver of the decline in this measure of economic health. 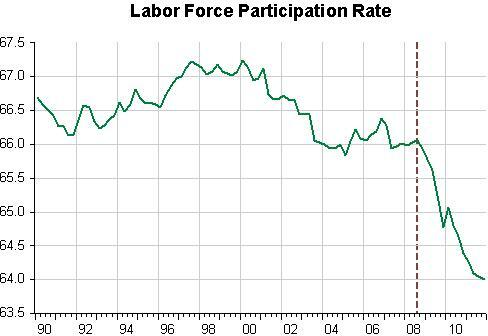 Given the source of this downward pressure, it is unlikely labor-force-participation rates will regain past heights. “Just under half of the post-1999 decline in the U.S. labor force participation rate…can be explained by long-running demographic patterns, such as the retirement of baby boomers,” the authors wrote. Unfortunately, the data does not agree! 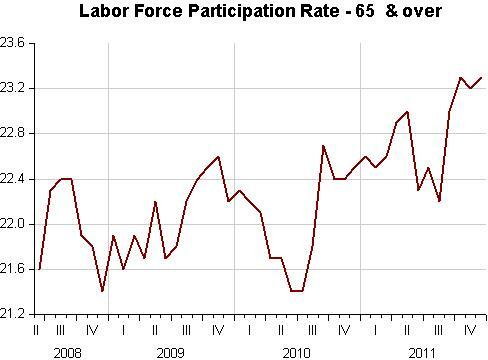 The BIG drop in the labor force participation rate takes place when nominal spending crashes after mid 2008. What has been happening to employment measures of “baby boomers – those over the age of 55? 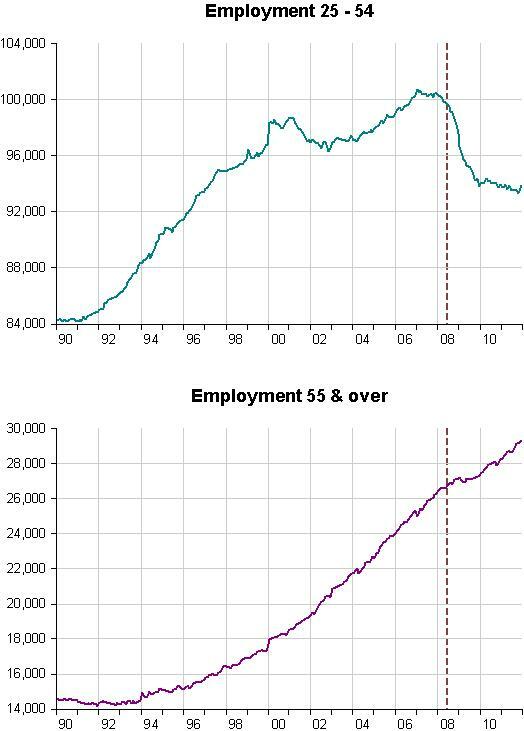 The charts below show employment for two categories – those between the ages of 25 and 54 and the BB group. Apparently the demand for the “experienced” baby boomers didn´t wane when NGDP crashed! And the clincher is the chart showing that labor force participation of the (supposed to be) retired baby boomers (those 65 and over – data only available from June 2008) has gone up! So they can´t be “driving” the decline in “this measure of economic health”. But this will surely not be the end of the search for “structural” explanations of the dire labor market situation. The fire sale of Baby Boomer assets is just as devastating in its own way, as the reduced labor participation by everyone else – no one is getting left out in the ‘benefits’ of this recession. Great and to the point write up. Beckey, what fire sale? In the RE market, almost all activity is in the lower end. The boomers can and will attempt to ride this out until the market never recovers and they die in their homes. Their heirs will THEN firesale the assets in the estate sales to get whatever they can. Alone, part-time, Marcus Nunes can easily out-analyse the entire Chicago Fed. Of course, Nunes has an advantage–he starts with the facts. The Chicago Fed evidently started with an agenda. Tom, sorry I should have been a bit more specific! Home prices continue to be propped up in spite of it all, it’s the assets lots of baby boomers once used for self employment that have taken hard hits, as the marketplace has changed. That has meant more baby boomers working for employers who might have otherwise hired younger workers.